Grow quality Twitter audiences for your clients. Save staff time (one of our clients is saving over $30,000 a month in staff time). See analytics on every audience you build. Show audience growth as a direct deliverable to your clients – they’ll love that and so will you! Phenomenal, awesome, incredible customer support. Need more reasons why tweepwise is perfect for your Agency? Easy to use! – Without tweepwise growing a quality Twitter audience is very difficult and staff HATE this task…save their sanity and make them more productive…use tweepwise! Quality (not quantity) – Guess what your clients want? Twitter followers that can become customers! End of story. Priced just right! 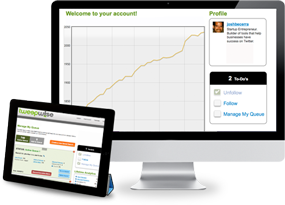 – Lots of room for your agency to markup the cost of tweepwise – now you’re saving time AND money! Perfect complement – tweepwise only focuses on audience growth which complements your other social media tools.